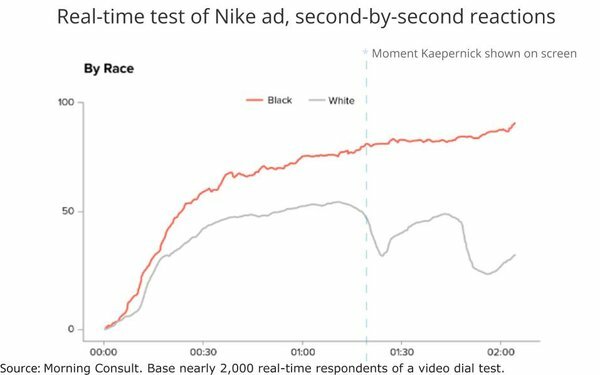 A real-time video dial-test of nearly 2,000 American viewers shows a polarization of responses throughout Nike’s “Just Do It” spot featuring controversial NFL protester Colin Kaepernick. Respondents to the Morning Consult test were asked to indicate in real time whether they had a favorable or unfavorable view of the commercial they were watching. This graphic shows explicitly what happens along racial lines when Kaepernick comes onscreen near the end of the spot. Self-reported dial responses from White respondents dive, while those of Black respondents spike. Overall, 39% of respondents said they had a very positive opinion of the ad, compared to just 9% who had a negative opinion. The test was conducted Sept. 6 and 7 among a national sample of 1,902 adults 18+. Respondents were shown Nike’s “Just Do It” ad, and then answered a series of questions about the commercial. The interviews were conducted online and the data were weighted to approximate a target sample of registered voters based on age, race/ethnicity, gender, educational attainment, and region. 2 comments about "Just View It: Real-Time Reactions To Nike's Kaepernick Spot". Ed Papazian from Media Dynamics Inc, September 10, 2018 at 8:55 a.m.
Joe, what's missing from this interesting report is a comparison with the norms in such studies for commercials of a similar nature--- or in general. If 39% of those who saw this commercial rated it very positively while only 9% were very negative, what if the normal findings were 55% and 5%, respectively? Then, it might not appear to be such a big success. Or if the norms were, 25% and 15%, then the Kaepernick spot would be seen in quite another light. Just curious. Laura Cowan from N/A, September 10, 2018 at 2:31 p.m.